The Nigerian Baptist Theological Seminary, Ogbomoso, Nigeria grew, like a mustard seed, from what started as a “Preachers’ Training Class” on May 3, 1898 to become a citadel of theological education – the best of its kind on the continent of Africa. 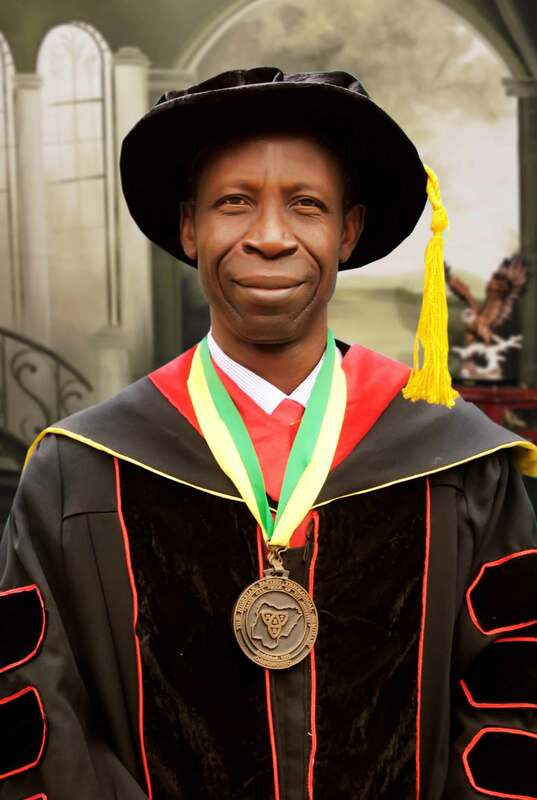 The Seminary is an academic institution, providing high-quality theological education and professional training for God-called men and women to help meet the need for effective leadership in the work of churches, schools and the denomination not only in Nigeria but also in other parts of Africa. To the glory of God, the Seminary, which is the premier theological institution in Nigeria, was the first tertiary institution in Nigeria to award degrees (1950), the graduands having met the requirements in 1948. It has one of the best theological institutional libraries in the whole of Africa. Offering curricula in the areas of theology, religious education, church music and missiology up to postgraduate levels, including doctoral programmes in theology and religious education The Seminary is equipped to meet the challenges of the new age in terms of theological education. Indeed, the institution has become a postgraduate theological school. As the Seminary continues its life’s journey in its second century of existence entering with faith, hope and courage into the twenty-first century and the third millennium, this call comes to all today, loud and clear, to “Make full Proof of Our Ministries” (2 Timothy 4.5b). Whether one is a student of the Seminary – past, present or future – or friends of the Seminary, or Christians of old, new or future generations, white or black, teacher or student, clergy or laity, technocrat or professional, politician, industrialist or business tycoon, rich or poor, young or old, male or female, this message remains the greatest challenge of life, the set goal in Christian living and standard of excellence in Christian faith and practice. On it, we take our pledge; on it we stake our life; on it the Seminary stands: “MAKE FULL PROOF OF YOUR MINISTRY.” May God help us so to do! Amen. To be a world-class theological institution to train God – called men and women to contribute to the transformation of society. The Nigerian Baptist Theological Seminary, Ogbomoso, Nigeria, a tertiary theological institution, under the leading of the Holy Spirit, is out to provide a high-quality theological education and professional training for God-called men and women, irrespective of ethnic, linguistic, social, educational, and economic differences to help meet the need for effective leadership in the work of churches, schools, and areas of denominational life at local, national and international levels in a way to facilitate the fulfillment of the Great Commission of our Lord and Saviour, Jesus Christ. The Lordship of Jesus Christ in every area of life-natural, physical and spiritual. The final authority of the Bible as the sufficient guide for faith, doctrine and practice. Congregational polity, both local (church autonomy) and connectional. Competency of the soul in religion under God. The priesthood of all Christian believers. Full religious liberty for all citizens. Independence of church and state. 1. provide quality theological education characterized by continuing commitment to serious and impartial investigation of truth in order to train effective ministers for churches in Africa. 2. develop in the student a critical, analytical and reflective thinking for a more effective learning and service. 3. provide knowledge and skills in ministerial training for men and women, irrespective of ethnic, linguistic and social-economic differences. 4. build effective leaders for church and society both nationally and internationally. 5. teach and apply the Christian faith and practice in its comprehensive and integrative nature for the transformation of the individual and community. 6. develop men and women who are able to effectively communicate the word of God. 7. equip people to fulfill the total mission of God for the world today. The Nigerian Baptist Convention (proprietor) has for many years endeavoured to provide to the Seminary the best buildings and required equipment within available means and dictates of reason. Thus, each building has been planned or adapted to render maximum usefulness. In 1955, the Seminary occupied its present home, an imposing complex of connected buildings designed along Georgian lines of architecture with pleasing and functional tropical adaptations. The main building in the academic complex houses both the Seminary chapel and the library (J.C. Pool Library), thus, providing the centre for both academic and spiritual life on campus. Flanking this main structure on the south is a wing with two upper floors, containing ten large, airy lecture rooms, and a lower floor with workshops and storerooms. The north wing of the campus, houses faculty officers, a faculty lounge and a conference room (now Senate Room) on the upper level with more faculty offices and a student lounge on the lower level. Adjacent to this wing is the Seminary administrative building, built in 1972 and 1984, which houses the administrative offices and the Learning Resources Centre. In 1973, an extension to the library was completed which greatly increased stack space and reading area for students and provided for an enlarged museum. With this addition and continuing acquisitions, the Seminary Library continues to rank among the best theological libraries in Africa. The Seminary Music and Communications Building is located to the Southwest of the main complex. The building, completed in 1979, contains music classrooms, a music library, faculty offices and practice booths for students learning to play keyboards and instruments. There is also a modern and well-equipped Mass Media Centre with three buildings which provides a training site for media specialists. This project reflects a concerned effort by the Nigerian Baptist Convention to proclaim the gospel through the mass media. Adjacent to the Seminary football pitch is located the Seminary Multi-purpose Hall of about 5,000 seater capacity for use of Seminary programmes. The former administration/classroom building near the new Seminary gate has been remodeled and is utilized primarily as the Museum and Archival Centre. Two buildings, one of which was completed in 1975, are being used for the Preschool Religious Education Centre. These facilities provide Pre-School for Children of Seminary Staff, Students and general public an excellent opportunity for obtaining good, foundational experiences for life and for entering the public school system at the appropriate age. These buildings are located near the students’ residential area. 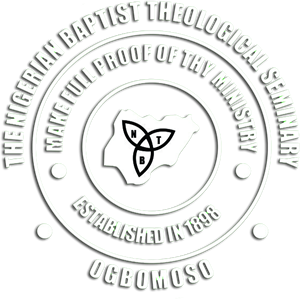 A new seal was adopted in 1970 for the Nigerian Baptist Theological Seminary. At the centre is a traditional Christian symbol called a triquetra, one of the most beautiful and satisfying symbols of the Holy Trinity. Eternal existence is expressed in the continuous lines, and they are interwoven to express unity. The centre forms an equilateral triangle which is itself a symbol of the Trinity. Each pair of arcs combines to form a “vesica”, indicative of glory. In this simple form is expressed equality, eternity, unity and glory. In the sections of the triquetra are the initials of the Seminary, identifying the school with the belief in the Triune God – a basic element of the faith and teaching of the entire Christian Church which the Seminary serves. This symbolism is set against a background of the map of Nigeria, placed within the outer circles of the seal representing the whole world as the goal of evangelism. Although the primary focus of the Seminary is to train persons for ministries in Nigeria, students from other African countries and from North America previously have studied here. The challenge of the Seminary to each of its students – past, present and future – is expressed in its motto to “make full proof of thy ministry” to the glory of God.